I'm not sure what took me so long, either. Outdoor Voices Women&apos;s Rec Kit, $95, available here. Now that spring is officially here, I am ready to come out of my winter hibernation and start moving again — or, as Outdoor Voices might put it, I&apos;m ready to be #DoingThings. 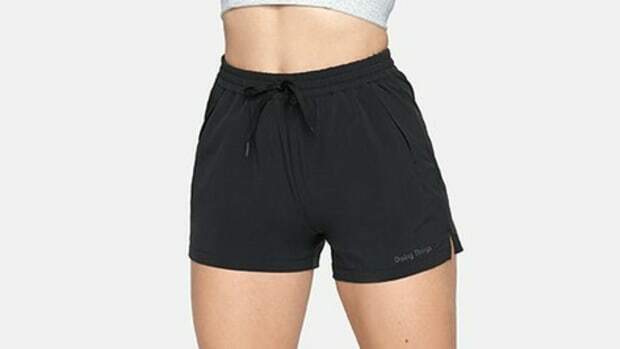 As someone who is on Instagram and who does not live under a rock, I have been aware of the buzzy workout gear brand for some time, but until recently, I have resisted its siren call of color-blocked leggings and cropped sports bras. But then I went digging through my drawer of athletic — let&apos;s be honest, athleisure — clothes and felt depressed. There was so much black and grey in the mix, nothing that would motivate me to get out and celebrate the warmer weather. None of this, of course, was the point of Jia Tolentino&apos;s excellent profile of Outdoor Voices for The New Yorker, but damn if it didn&apos;t make me curious enough about the hype to finally give the brand a try. I picked up one of the brand&apos;s rec kits, going for a hunter green and ballet pink legging with a matching top, and tried it on at home with plenty of skepticism. How could a set of workout clothes live up to any hype? Reader, it did. The pieces fit well, and to my earlier point, looked cute. Maybe that&apos;s shallow, but hey: I&apos;m not the kind of athlete who needs tactical gear. I just need a little extra motivation to abandon a "Big Mouth" binge on the couch from time to time, and this will definitely do the trick. I'm reactivating my ClassPass, thanks to a grassy, green-colored unitard. They're called "CloudKnit" for a reason. They're basically the 2018 version of my beloved early-aughts Soffes. This seasonal set mixes something blue – very wedding-appropriate – with pale pink.